Not many experts had given Viswanathan Anand a chance coming in to candidates after he lost the world championship match against Magnus Carlsen of Norway in November last year. Five-time world champion Viswanthan Anand continued his fine form and crashed through the defences of Shakhriyar Mamedyarov of Azerbaijan to notch up his second successive win in the Candidates Chess tournament. Not many experts had given Anand a chance coming in to candidates after he lost the world championship match against Magnus Carlsen of Norway in November last year. With 2.5 points in his kitty from the first three games, Anand is likely to be joined by Peter Svidler of Russia in the lead. Svidler enjoyed a commanding position against compatriot Vladimir Kramnik in their match. The other two games in the eight-player double round robin tournament ended in draws. Former world champion Veselin Topalov of Bulgaria missed out on his chances against top seed Levon Aronian of Armenia while Dmitry Andreikin signed peace with fellow Russian Sergey Karjakin after playing solidly as white. With 11 rounds still to come, Topalov and Aronian are on 1.5 points and Kramnik has the same score with a game in hand. Andreikin and Karjakin both have one point from three outings and Mamedyarov is currently at the bottom with just a half point in his kitty so far. The fact that the victory came with black pieces was icing on the cake for Anand. Playing the Modern variation in the Slav defense, Anand had little trouble equalising out of the opening and Mamedyarov was also looking at dynamic possibilities after losing the previous round. On move 24 Anand deployed his queen in an attacking position and Mamedyarov realised that he was already much worse. 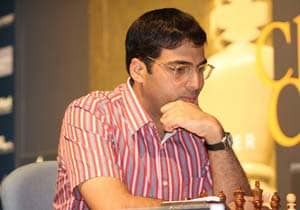 The pressure got to the Azeri Grandmaster sooner than expected as he caved in through a blunder on the 26th move itself. Anand wrapped the issue in 31 moves.